Nelkin Designs Blog: An Act of Love! 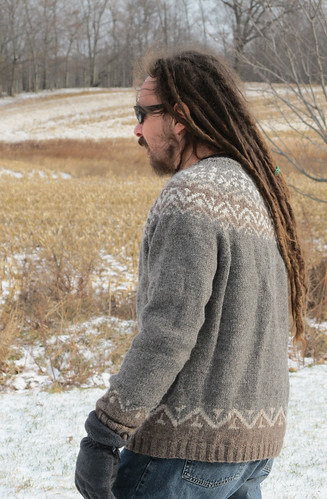 Right about this time last year I started thinking about knitting my man a sweater. I knit him one when I first learned how to knit that was a GINORMOUS FAIL. It is so bad, in fact, that you will NEVER see pics of it. It really was time that he have a sweater made by me! I am smitten with seamless yoke sweaters and while knitting Cascabel I realized that I wanted to work with Elizabeth Zimmermann's EPS system for a seamless yoke sweater and just go for it. 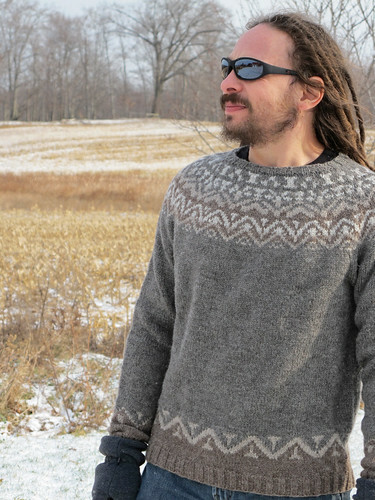 One of the best parts of this project is that I didn't have to write the pattern, I made decisions as I went, figured out color work and numbers on the fly... this sweater is not supposed to be duplicated, it's just for him, just this once. Oh my, how freeing! All of my knitting/designing is always meticulously documented and thought about at every step of the process so that others can follow my directions. Max's sweater was all about each moment and stage of the design. I wish I could share what my notes looked like for it, unbelievably sketchy, but true to form, I LOST them, how perfect is that? My honey is shaped like an upside down triangle... i.e. his shoulders are bigger than his waist. So I cast on the appropriate number of sts for his waist size and then did gradual increases to get to his chest size. I knit the sleeves a bit on the snug side as I know he doesn't like them baggy and then worked some decreases for the yoke before starting the colorwork. I was worried it would make his chest look too wide if I started the colorwork sooner. I'm not sure this step was necessary but it works! I ended up using Cascade Ecowool. The body is color 8049, the cuffs 8085, and the colorwork 8061 and 8017. I love the wooliness of this yarn, knit at 5 sts to the inch it's a bit dense and wind resistant. I think it will make a great ski sweater! Though, next time I knit a sweater for him I think it's going to be in Shelter! I'm unbelievably lucky that Max is a partner in this venture and one perk is that I have a live-in computer guru. (And hence, I have a pretty awesome website that doesn't break that often.) This sweater is just one way to thank my love for being everything and then some! lucky man! nicely done! i've often thought of the original knitting etc. friday group telling stories about "the man sweater"... he must be worth it! It's a beautiful, one of a kind, sweater and it fits him very well. Congrats! 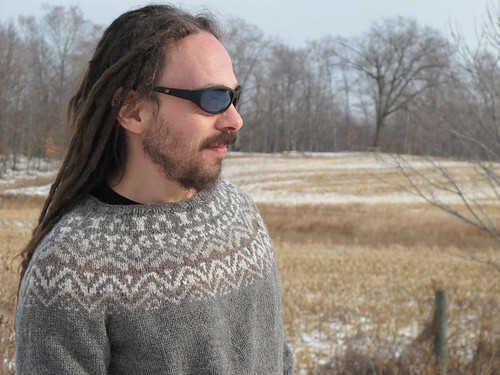 I love your story about the first, never-will-be-seen sweater. I did the SAME thing for Chris' first sweater. It was an over-ambitious, technically wonky labor of love, and it was AWFUL. The sweater is gorgeous, but it's partly due to the design which is one of a kind, but in part it's also because you chose something that reflects the best qualities of the person for whom it was knit. And if I may say so, the model is pretty awesome looking, too. A winning combination for sure! Thanks everyone! The labor of love definitely paid off as he's worn it almost everyday since I gave it to him! And Mercedes... perhaps we need a hall of shame for those projects we don't allow to see the light of day : )! The sweater turned out gorgeous! 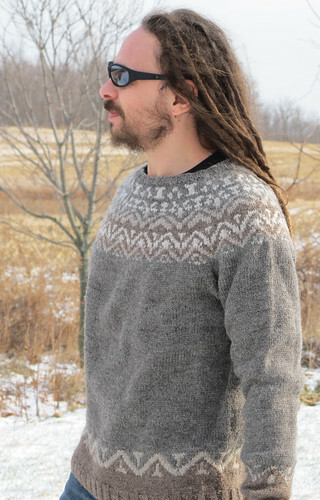 The colorwork is beautiful, and the sweater fits him well...with enough room to layer underneath if need be! Success! It's great. I love the muted colors. Greg's Hadley-made sweater just wore through the elbows yesterday, which made me so happy. Happy because he loves wearing it that much. What a sweet success, that sweater totally suits him. (sweasters him? whatever) .